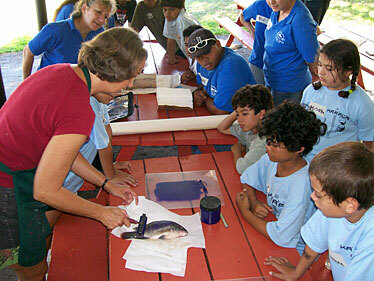 A demonstration on using fish to paint was held at a Big Brothers Big Sisters program at Kualoa Ranch. Sometimes it takes four community groups to mentor some disadvantaged children in Windward Oahu. Principal Todd Watanabe of Kaaawa Elementary School is delighted that a dozen "disadvantaged" 10- and 11-year-olds who need a bit of extra attention will benefit from a new partnership of the organizations providing educational mentoring at Kualoa Ranch. Big Brothers Big Sisters took the lead, forging the hybrid program with Kamehameha Schools, the Honolulu Academy of Arts and Kualoa Ranch. For two hours once a month, a dozen ranch employees have volunteered to be mentors during afterschool cultural, arts and educational activities. Tyler Kurashige, the Big Brothers coordinator, said the innovation comes with focusing on kids from a particular school in a low-income community, "and everyone's (the organizations involved) brought his own specialty to the table." The Kamehameha Schools mentoring branch is providing the cultural/educational aspect of the activities, said coordinator Gina Karas. The program is not so much targeting kids of Hawaiian ancestry or those with problems, but children "selected by the school who could benefit from additional support (of) one-on-one attention." 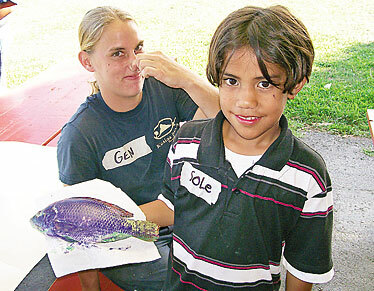 Mentor Genevieve Story and a student named Sole with a fish painting. They are children whose family status is nontraditional -- some may come from foster care or are being raised by grandparents, she added. At a session earlier this month, the children learned the art of "gyotaku" or printing with real objects -- in this case, fish -- from Tamara Moan of the Academy of Arts. She was tightly surrounded by kids unfazed by the pungent tilapia. Questions were squeezed in between instructions to first dry off the fish slime, roll ink onto a roller and paint the fish with the roller. Moan showed them how to lay a piece of paper on the fish -- "Do we punch it?" someone piped in. "No, we press the paper over it very gently," Moan said patiently. "Do we have to be careful not to get paint in his eye?" "No, he's a dead fish so it doesn't matter," Moan answered. She used brilliant purple ink to demonstrate, highlighting the top fin and tail with bright fuchsia, eliciting lots of "ooohs." Taz and Stephen (no last names were given) shared a fish, of which Stephen suggested, "Let's just name it Bob." Taz put only one glove on because "I don't mind touching it." Stephen donned two because, he said, "I don't want to feel slimy." At another table Thor painted his fish "rasta colors" -- green, yellow and red horizontal stripes, and smiled proudly at how it turned out. His mentor, Lehua Lau, said, "I thought it was a great way to give back to all the children who visit the ranch," she said, and "they (the ranch) made it very, very easy." Jarma Hudson, a ranch employee for seven years, said her grandson used to attend Kaaawa Elementary and brought all his friends "to hang out at my house." "They all know who I am," Hudson said, and "I felt a need to be there" for them. Timon Leong, Kualoa Ranch's human resources director and mentoring coordinator, said, "Even though many of us do not live in this community, since we spend so much time here at work we feel so much a part of it and want to give back. Being a 'Big' to a child can make a difference, not only for them but for ourselves. The satisfaction of seeing the smiles and feeling the appreciation, is like they say ... priceless."